The Illinois River Energy biofuels plant in Rochelle releases plumes of steam at sunrise. The ethanol plant processes over 40 million bushels of corn into 115 million gallons of fuel grade ethanol annually. Earlier this summer my colleagues and I began probing the tightening environmental and economic choke points around the United States caused by rising energy production and diminishing quantities of fresh water. This week we broke a new chapter in the story that described a far-reaching federal program of research and analysis, funded by Congress and designed to help the nation anticipate and temper the mounting conflict between rising energy demand and diminishing supplies of fresh water, has been brought to a standstill by the Department of Energy. The research program, known as the National Energy-Water Roadmap and ordered up by Congress as part of the 2005 Energy Security Act, was meant to provide lawmakers and the executive branch two studies of the impending collision between energy and water, as well as what to do about it. The first report, completed by a team of federal scientists in December 2006 and made public a month later, described the serious consequences the nation is already encountering as the U.S. encourages more energy production– the second largest user of water– while giving scant consideration to water supplies, which are in retreat in most parts of the country. But the second and final report that Congress commissioned, a comprehensive research agenda to better understand the nation’s energy-water choke points and begin developing real world solutions, has been held out of public view for more than four years. Michael Hightower, an energy systems analyst at Sandia National Laboratories and a co-author, said the first draft of the Road Map on research needs was delivered to the Energy Department in July 2006. Energy Department reviewers have since called for 22 rewrites, the last of which was delivered in May 2009, he said. Since then, the five-member team that co-authored the study has not had any communication about the report with the two primary reviewers. Circle of Blue’s report is the latest chapter in the Choke Point: U.S. series, a penetrating exploration of the fierce contest between the nation’s growing demand for energy, and the tightening supplies of fresh water. Next to agriculture, energy production withdraws and uses more water than any other sector of the American economy. The Choke Point: U.S. report, which started on August 3 with a dispatch from the southern Virginia coal fields, and has added new chapters weekly, makes a strong case that the United States quickly needs to reconsider and realign much of its energy production policy and water management practices in order to avoid dire shortages of water and potential shortfalls in energy. None of the big energy producers or large water use sectors will be left untouched. The complete findings of Choke Point: U.S. will be presented later this month at the Woodrow Wilson International Center For Scholars in Washington, D.C. The public event, Choke Point: U.S. Understanding the Tightening Conflict Between Energy and Water in the Era of Climate Change, occurs on September 22, 2010, from 9:00 a.m. to 11:00 a.m. Unless there are sharp changes in investment and direction, the transition to a clean energy economy will lead to a severe water penalty for the United States. With the exception of solar photovoltaics and wind, the other clean energy sources uses more water per BTU generated than conventional fossil fuels and nuclear energy. In transportation fuels, every alternative — biodiesel, ethanol, shale oil, and tar sands — boosts water consumption by two to 6,500. Investment in “unconventional” fuel sources to replace “conventional” reserves of oil and natural gas dwarf clean energy spending. Energy industry executives, fortified by high prices for oil and natural gas, are investing tens of billions of dollars annually to develop oil-bearing sands and shales, and deep gas-bearing shales. The annual investment is far larger than what the nation is spending to make the transition to a clean energy economy. And each of the unconventional reserves produces more carbon emissions, uses more water, and damages more land than the conventional oil and gas reserves they are replacing. The concept of “peak oil” may turn out to be a myth. The recoverable oil reserves contained in bitumen-saturated tar sands and oil shales amount to trillions of barrels and are greater than the recoverable “conventional” reserves. Canada’s tar sands are already the single largest source of exported oil to the United States and production is increasing almost 10 percent a year. North Dakota is now the fourth largest oil producing state because of reserves discovered in the Bakken Shale. Three years ago North Dakota was barely in the top ten. 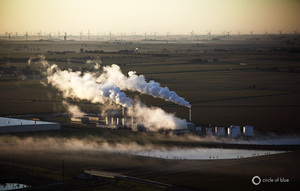 Carbon capture and storage technology, which is undergoing a handful of tests as a fix to climate changing emissions increases water consumption at conventional plants 40 percent to 90 percent. Water Scarcity Prompts Different Plans to Reckon With Energy Choke Point in the U.S.